Santa Barbara’s Urban Wine Trail is unique. Follow it and you get to explore Santa Barbara from elegant State Street and the historic El Paseo shopping center where you will find Grassini, Au Bon Climat and Margerum, to the outskirts of the Funk Zone where Carr resides in it’s Quonsit hut making you feel like you’ve walked right into a barrel. Cross the train tracks and stop by AVA Santa Barbara where you can taste wines from all the AVA’s in the area and see the huge Elkpen mural mapping out the unique climate, soils and history of the AVA’s. Stroll down the block and stop at Santa Barbara Winery one of the very first in this area. Anacapa Street is teaming with tasting rooms like Oreana, Kunin and of course Municipal Winemakers which looks like a dive shop and has a wall of filing cabinets. As you stroll between the tasting rooms take in the Funk zone with it’s murals and small artist shops and galleries. The Santa Barbara Surf Museum is there as well as plenty of surfboard and dive shops. Keep walking and you will hit the beach. Grab a segway or a bike or just walk the beach. Head out on to the wharf and visit the Aquarium or just enjoy watching the fishermen. Stop by Conway Family Wines Deep Sea tasting room with a 2nd story patio to enjoy the view with a glass of wine. Don’t miss sunset at the end of the wharf and the parade of boats returning to the marina. It makes for a perfect day…although 2 would be even better. Santa Barbara Celebrated the Vintners Spring Weekend in April and the crowning event for the weekend was the Grand Tasting held at Riverview Park in Buellton. What I love most about Santa Barbara County is that the wines are amazing and the people are laid back and approachable. The Grand Tasting had something for everyone. For a start, this area because of it’s climate, is home to so many varieties. Sta. Rita Hills and parts of the Santa Maria Valley bring Chardonnay and Pinot Noir, while the central part of the Santa Ynez Valley is perfect for growing all the Rhone Varieties and further inland in Happy Canyon, the weather is warm enough to grow Cabernet and Sauvignon Blanc. That doesn’t even touch on the Italian and other lesser known varieties that are being grown. So a wine lover can taste the spectrum at the Grand Tasting. 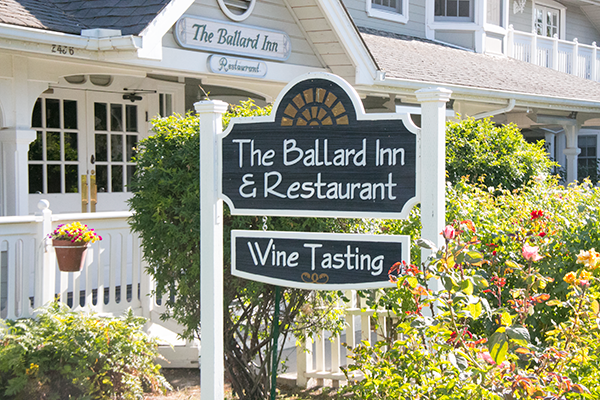 The warm atmosphere of the Ballard Inn, was the perfect setting to enjoy the beautiful wines of Larner Vineyard and Winery grown in the brand new Ballard Canyon AVA (by the man who got this AVA going) and have them paired with the Asian & New French inspired dishes of Chef Budi Kazali. On industrial way in Buellton CA, you might not expect to find a dinner of fine wines and food pairings, but you are in Santa Barbara County and you should expect the unexpected. Industrial eats was the location for this years Sta. Rita Hills AVA dinner at the SB Vintners Spring Weekend. The evening started with a Clos Pepe Pinot Sparkling Wine, and Appetizer of Sea Urchin with avocado and just got better from there. On Hand to discuss the wines were, Wes Hagen from Clos Pepe and Ken Brown, from Ken Brown Wines, along with Laura Roach, Enologist for Sanford wines and Jeff Connick, assistant wine maker from Dierberg & Star Lane wines. Beckmen Vineyard Hike with Steve Beckmen during the SB Vintners Spring Weekend. Hiking, Wine and Conversation with Steve Beckmen Architect of Beckmen Vineyards. Stunning Panoramic Views with amazing views from the hilltop and vineyard education, with wine, food and cardio all built into one unique Experience. The drive to Purisima Mountain was like taking a step back into my childhood, the curving roads at the top of this canyon reminded me of southern West Virginia, with one dramatic difference…there were vineyards on these hills. WE made this trek during the Spring Vintners Weekend, when we were lucky enough to do a Vineyard hike with Steve Beckmen at the Purisima Mountain Vineyard. Located in the new Ballard Canyon AVA this property sits at the north end of the Canyon. From Ballard Canyon Road you drive up and around the Stolpman property to reach the 365 acre property. This estate vineyard is planted primarily with Syrah & Grenache with smaller blocks of Roussanne, Marsanne, Counoise, Mourvedre, Grenach Blanc, Sauvignon Blanc and Cabernet Sauvignon. This vineyard became 100% biodynamic in 2006 and uses a gravity fed drip irrigation system. We had the opportunity to speak one on one with Michael Larner of Larner Vineyards and Winery in Ballard Canyon, out at the vineyard. This beautiful property is at the Southern end of the new Ballard Canyon AVA. In this Video Michael talks about the formation and the plans for the new Ballard Canyon AVA. Michael Larner has been thrown some curve balls as he has worked to build the future of Larner Vineyard and Winery. The vision for this family legacy was to be an estate winery with a tasting room and some events. When they took this business plan to the county, the neighbors revolted. So they worked to be dynamic in dealing with these issues, continuing with the vineyard, opening a wine tasting room in Los Olivos and then Michael created the Buellton Bodegas. The property in Ballard Canyon, has a barn, which they hope in the future be able to turn into a winery, and a small General Store building and turning it into a tasting room. They are currently asking for an 8000 case production for the winery, the tasting room and then 4 events each year which all would be shuttled. This is the vision, so people can come and see the source. Michael Larner’s parents found Ballard Canyon to be a magical place. From the curvy roads at the top of the canyon, the expansive views from Purisima Mountain Vineyard and they delicious way that Rhone Variety grapes grow here, I have to agree. Amidst the “eclecticness” that is Santa Barbara County, this quiet valley is growing some amazing grapes, primarily Rhones, with a focus on the Champion grape of this valley, Syrah. We had an opportunity to spend some time with Michael Larner of Larner Vineyards and Winery out at his Ballard Canyon Vineyard earlier this year. In this video, he tells us about the history of his vineyard here in Ballard Canyon. Michael Larner’s father had wanted to own a vineyard. After spending time doing documentaries on wineries and vineyards in France he was smitten with the idea of this type of lifestyle and with the thought of a family legacy that could be handed down. Living in LA, Santa Barbara County was practically in their backyard and they found this property in Ballard Canyon. Covered in sage and chaparral they started making 34 acres of the 134 acre property ready for a vineyard in 1998. Michael was a geologist. He went into geology to avoid lab coats or sitting behind a desk. “the idea of working outside, being with the family and maybe actually making a product that’s really kind of cool was exciting”. When you are a wine geek, there is no place you would rather be than tasting wine with a winemaker. In June, the Santa Barbara Vintners held their 1st Key to Wine Country Weekend. The weekend included multiple events at various wineries, meant to give you an insiders perspective on winemaking in Santa Barbara. 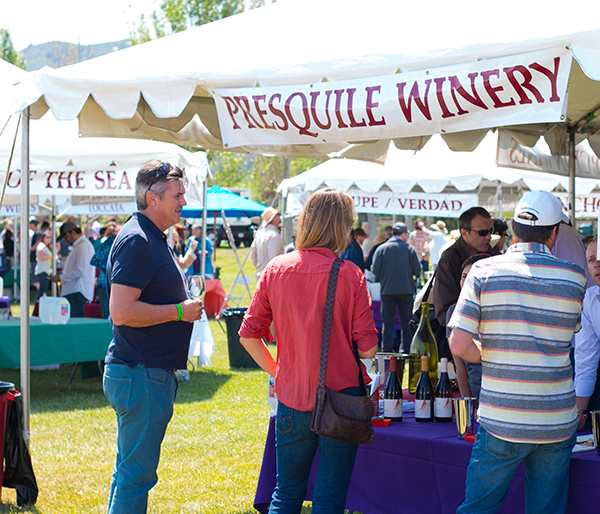 Presqu’ile set up an event for Key Weekend, that gave you the opportunity to taste with 4 different winemakers. The amazing thing about this, was that all four winemakers were making wine from the grapes from the same vineyard. A side by side tasting while listening to the winemakers each speak about their wines was wine geek bliss. This event was held at Presqu’ile Winery on the crush pad at the top of their beautiful gravity flow winery. Past the tables set with glassware and charcuterie were 4 smaller tables, behind which sat our winemakers. Presqu’ile Winemaker Dieter Cronje, was joined by Storm Winemaker Ernst Storm, Luceant Luminesce Winemaker Kevin Law and Labyrinth Winemaker Ariki Hill. The discussion itself lasted a bit over an hour and we have split the conversation into 4 parts. This first section includes an introduction by Presqu’ile owner Matt Murphy, a bit of Santa Maria Valley history from Presqu’ile winemaker Dieter Cronje and then a side by side tasting of the Presqu’ile 2013 Sauvignon Blanc and the Storm Wines 2012 Sauvignon Blanc. In our second installment of the amazing conversation at the Presqu’ile Winery Key to Wine Country Event, we move on to a side by side tasting of Chardonnays. The grapes for these two Chardonnays were again both grown on the Presqu’ile Vineyard. The Presqu’ile Chardonnay, made by winemaker Dieter Cronje is aged in neutral oak for 18 months. They typically harvest their Chardonnay early to retain the acidity. This is a mix of clones including Dijon clones 95 and 96 as well as the Davis clone 4. They had also been playing with a sparkling program and had some grapes from the 131 and 124 Champagne clones that were included. The Labyrinth Chardonnay was all from Block B. Ariki Hill ages this Chardonnay in 30% new oak and the wine is fermented in the barrel on the lees. Ariki hails from New Zealand. While working in the dairy industry he started his winemaking. He found many similarities in handling fragile milk products and grape juice for wine. He pursues balanced wines that feature the region. He currently makes wines from Santa Barbara County, Paso Robles and the Yarra Valley in Australia. Most of his Paso wines are under the HAKA label. You can find more details about Rick and his wines on his website at https://labyrinthwine.com. We continue with the third segment of the Key to Wine Country event held at Presqu’ile Vineyard in the Santa Maria Valley of Santa Barbara County. Held on the crush pad high atop the Presqu’ile gravity flow winery, we had the opportunity to taste wines made by 4 different winemakers, all from grapes grown on the Presqu’ile Vineyard. After side by sides of Sauvignon Blanc and Chardonnay, we moved onto Pinot Noir of which there were 5 to taste. In this section we taste through the Presqu’ile 2012 Pinot Noir made by Presqu’ile Winemaker Dieter Cronje as well at 2 Pinots from Luceant Luminesce a 2011 and a 2012. The Presqu’ile 2012 Pinot Noir was done with whole clusters and spent 18 months in neutral oak. It was fascinating to do a side by side with Kevin Law’s 2011 and 2012 Luceant Luminesce Pinot Noirs. Again all the grapes are from Presqu’ile Vineyard. 2011 was a cooler year and Kevin used 1/3 whole cluster and 25% new oak for this vintage, as opposed to the 2012 which was bigger. The 2012 vintage he went 75% whole cluster and 50% new oak. It’s amazing to see the difference a vintage can make as well as the differences created by the amount of whole cluster press and oak which can impart tannins and other flavors.